At CyFrame we believe that improving customer retention and providing an optimal level of customer service s results from the delivery of high-quality products on-time and on budget. Focusing on key simple KPI metrics is sound business practice. Unlike other solution providers, we offer simple yet valuable metrics that are not overwhelming and unmanageable for plastics processors. Providing easy access to KPI’s as well as the key supporting reports results in effective and successful management activities. The Daily Production Profitability report is probably the most important report in our MES suite. The main focus of that report is "did I generate a positive company cash flow from the good parts I produced today?". Based on the simplest method, CyFrame makes it transparent to the production MES process and requires the least amount of time to setup and maintain. With a great level of accuracy, it determines if the production by shift produced the desired daily profit target results. Access your machine, production performance and profitability in real-time, across all plants and work centers and eliminate uncertainty and late conflicting reporting, period. 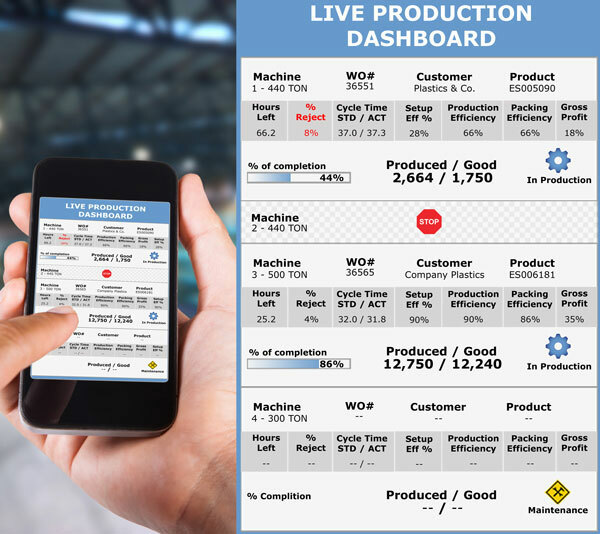 Our mobile phone optimized live machine dashboard ensures your plant manager has up to the minute, total visibility of his shop floor. Track and monitor machine setup performance, live machine status (In-Setup, In Production, Downtime, Maintenance), standard to actual machine efficiency, rejects, percentage of job competition and line profitability with ease. The CyFrame MES production efficiency report is the key element to clearly identify and analyze the activities from n the production shop floor. It reports on the production speed efficiency, downtimes, actual part count versus the estimated good parts that should have been produced, the actual yield considering rejects and finally the amount of raw material it took versus what was planned from the detailed production entries made on each work order. A work order cost summary report is then produced from that data to compare the actual to the estimated cost which sequentially is compiled in the Production Profitability Summary report by Customer and Products from which all the drill-down reports can be accessed for a full analysis. The cost summary is completed when the work order is closed from production.